Maybelline is launching its Color Sensational line of lipsticks in Singapore, and I am so excited for these. Although we aren't getting in the whole range of shades (we are getting just under half of the 54 shades available), there's a wide array of shades guaranteed to have something for everyone. The selling point of the Color Sensational Lipsticks is two-fold: first, the pigment in the lipsticks is supposed to give good colour payoff; second, the lipsticks are supposed to feel creamy and non-drying. Sounds great right? 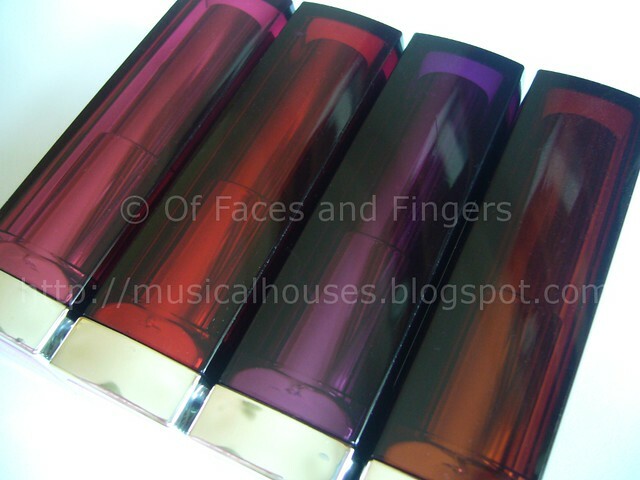 The lipsticks come in rather clunky, brightly coloured plastic packaging. I have four colours, and the colour of the plastic packaging is different on each of them. That's a cute touch. 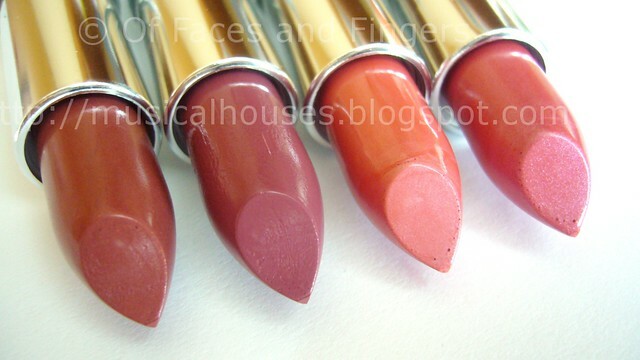 The lipsticks themselves come in a good range of shades. I have Pink Peony, Peachy Scene, Yummy Plummy, and Tinted Taupe - thus covering all the bases of pink, peach, plum, and neutral. I've read some reviews where the scent of the lipsticks were noted as being unpleasant. It seems to be a little hit-and-miss, depending on which batch you get, but mine smelled fine. The lipsticks I got had a slight vanilla smell, but otherwise they were mostly scent-less, if a little bit plastic-y. 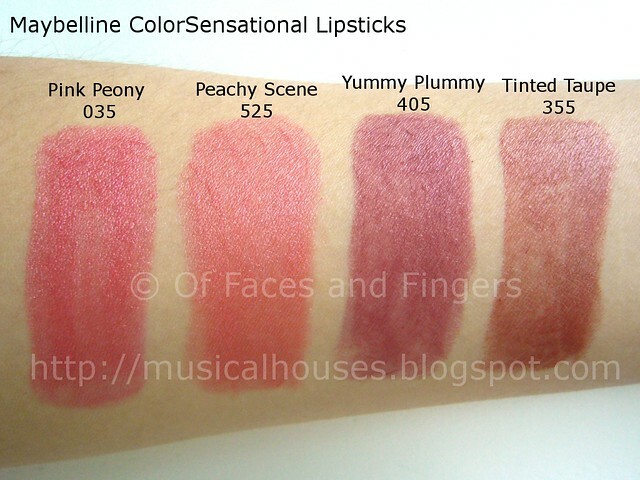 Here are swatches of the lipsticks. As you cam see, they do have good pigmentation, and are fully opaque after a few swipes. And every single colour is very wearable, too. Maybelline have chosen their shades well. Pink Peony is a shimmery light pink, Peachy Scene is, as the name describes, a peach shade with shimmer, Yummy Plummy is a purply-pink plum shade (more purple leaning than pink, methinks), and Tinted Taupe isn't actually taupe at all, but a medium-dark MLBB (my lips but better) pinky-brown shade. Pink Peony and Peachy Scene both have shimmer, bordering on frost, while Yummy Plummy and Tinted Taupe both are cream finishes with no shimmer. Here's Pink Peony on my lips. As you can see, the shimmer is more obvious on the lips than in the tube, and looks a little frosty on. The pink shade is very pretty, though. Peachy Scene has the same almost-frost finish as Pink Peony. This peach shade would look better on warmer-toned girls, but even on me I think it looks quite wearable. Yummy Plummy is probably my favourite of the bunch, together with Tinted Taupe. It's a gorgeous grapey plum colour that's very wearable. And I love the finish too - it's creamy without feeling or looking matte. Lastly, Tinted Taupe. This is a very wearable pink-brown colour, sort of like MAC Twig, but lighter and a bit less brown. In anycase it's in the same colour family, and has the same matte-but-creamy finish which I quite like. Both Pink Peony and Peachy Scene glided on fairly well, but I didn't feel like they were particularly moisturizing or drying...they were just all right, I guess. In fact, I feel like the frosty glitter was more likely to accentuate the look of fine lines and dry spots on the lips. I felt like the cream finishes, Yummy Plummy and Tinted Taupe, were more moisturizing and didn't accentuate lines or uneven spots on my lips. I'm pretty excited about the Maybelline Color Sensational Lipsticks, and I think they're pretty good for a drugstore range - they have good colours, a decently nice formula and are overall good value for money. If you find a colour you like, it's worth a try. Just cross your fingers and hope you don't get one of the stinky tubes. I need to get Yummy Plummy! So gorgeous! These are alll very wearable, and pretty! Peachy Scene is very pretty. Too bad Maybelline tests on animals so I stopped using them. Yummy Plummy and Tinted Taupe look so beautiful! Ooh! These are all nice, soft colors. Definitely a step away from the drastic, vampy shades we see for fall.